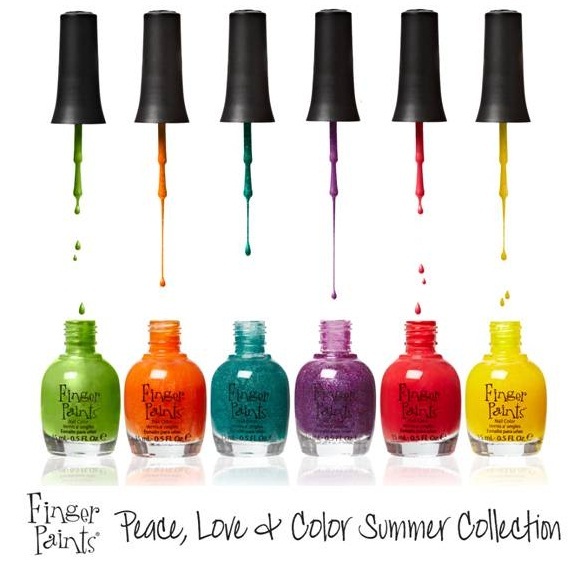 This year's Finger Paints Summer Collection consists of 6 fun and bold shades, creme, shimmers and glitters! Groovy Green is a very unusual grass green with silver shimmer. I had issues with application, the polish was really hard to work with. I tried to add a bit tons of thinner and that helped but not much. I'd recommand 2 thin coats and patience. Apart from this, it's really something different, I don't really know what to think of it with the brushstrokes and all but once mattified wow!!! 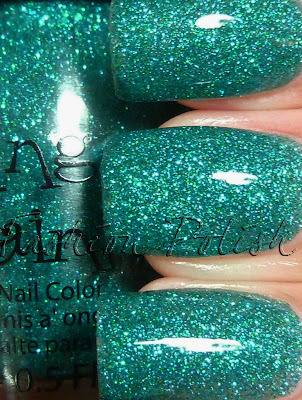 It's like a green version of Zoya Phoebe. Outta Sight Orange is probably the one I I was the most impatient to try on and good thing is it didn't disappoint. Opaque in 2 easy coats, super sparkly with tons of microshimmer and a subtle pink flash. What's not to love? All you need is color. Teal glitter!!! This one is really awesome turquoise and green glitter in a clear base. You're looking at 3 coats with topcoat. I didn't have my bottle of Seche Vite at hand so I used a regular topcoat but it wasn't thick enough to even out the glitter but that's old news when it comes to glitter, they tend to eat the topcoat. Apart from that it dried pretty fast and formula was fine. Peacefull Purple has the exact same formula as All you need is color, super sparkly, 3 coater. It might not be the most original but it's sooo beautiful. It's a bit warmer in real life but you know purples, right? They seem to be camera shy. Give Pink a Chance is a breathtaking red-pink-coral-honeysuckle... It's so rich and pretty in person. I can really see it complimenting a lot of skin tones. Formula was perfection, 2 coats and a glossy finish. Psychedelic Sunshine is the one that gave me the most trouble. It's goopy and it leaves Visible Nail Line (VNL) but it's so pretty in the bottle that I had to figure something out : I can't let a sunshine yellow with holographic glitter go to waste! You can see it below alone (3 coats) and with one coat over white. It looks amazing this way. I can't wait to know what you think about these... I know I'm totally in love with the orange, pink and teal glitter but the purple is beautiful, the green looks just perfect mattified and the holographic yellow is so bright and original. I went to Sally Beauty to buy some of these including All You Need Is Color. 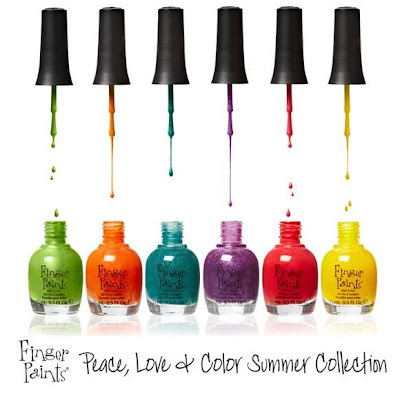 I picked them up off the display but it wasn't until I got home that I realized that instead of All You Need Is Color I got Art You Wondering?, one of the new colors Finger Paints is adding to their year round collection. I'm pretty sure Art You Wondering and All You Need Is Color are the exact same polish. Did anyone else notice this? I have 2 other yellow jellies and they are the same way...goopy. But they well worth it. I guess I'm off to Sally's to snag up the glitters. Love this collection. I don't own any of this brand. I love the green matted! That's orange is gorgeous. I'm gonna need the teal and purple for sure! So pretty! Your blog is SO awesome, how have I never found you before? :) I'm going to follow you now!! I love the yellow jelly. I think it looks better without the white underneath because it gives a two toned effect. But I would wear it both ways to have two different looks. I wonder is it similar to CG lighthouse? The purple looks amazing and love the yellow over white. I wouldn't have thought to do that. Thanks girls for all your kind words!